The Renaissance is a work of beauty – the 9th taken on a nicer day than when I played. The Renaissance Club is one of a small but growing number of exclusive private member golf clubs in Scotland. It combines a world class golf course and facilities with an American style family friendly country club set up, with fine dining, although the latter type of country club is also now very common in South Africa and Australia. 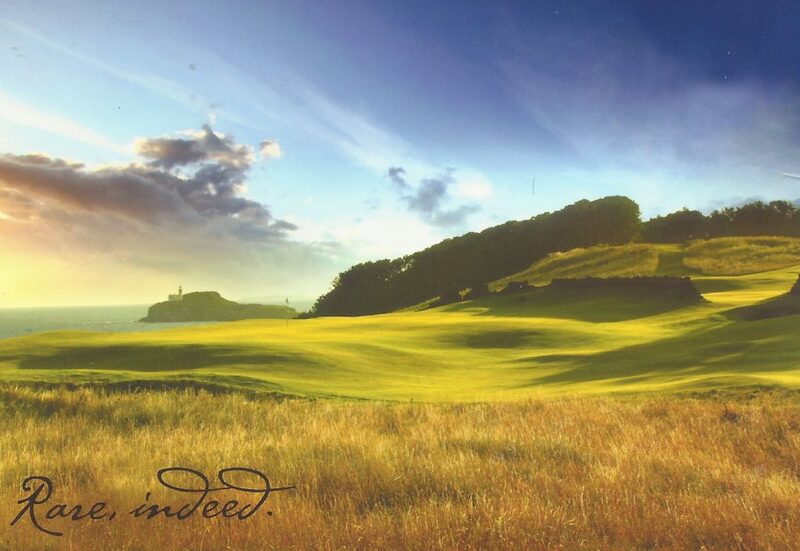 The course sits just east of Muirfield, its famous neighbour, on the North Berwick coastline. 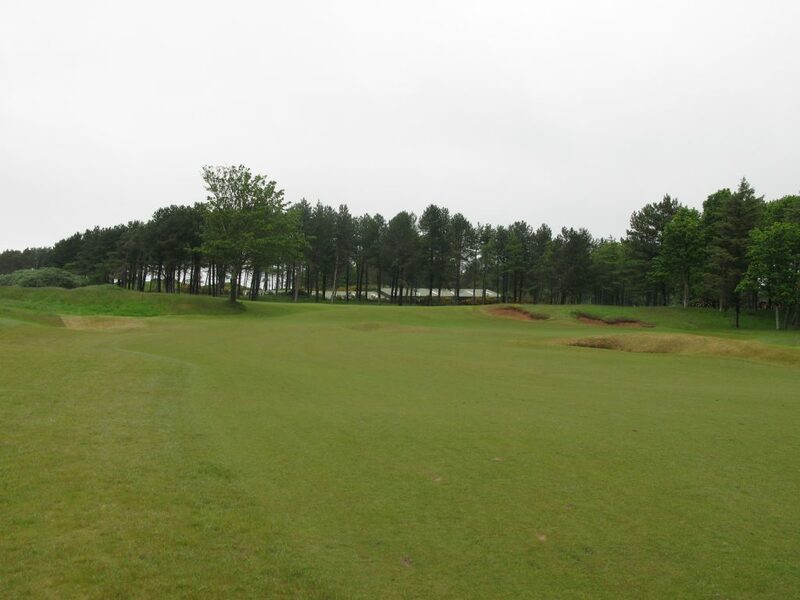 The architect of The Renaissance, Tom Doak, is renowned for his use of natural contours and not “bulldozing” the land and he has laid the course around several copses of existing trees; therefore this is a course that looks much more like parts of the great links of Carnoustie, Dornoch or Nairn Dunbar, than the treeless Muirfield. The result is a quite magnificent layout that in my opinion will stand the test of time. 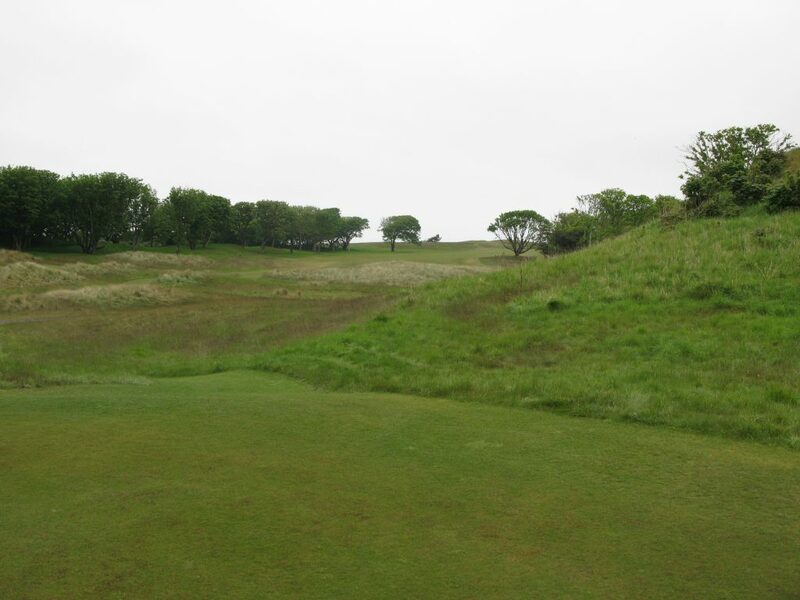 With widely different tee options, this can be played at 6121 yards off yellow, 6766 yards off white, and a monster 7293 yards off the professional championship blue tees. 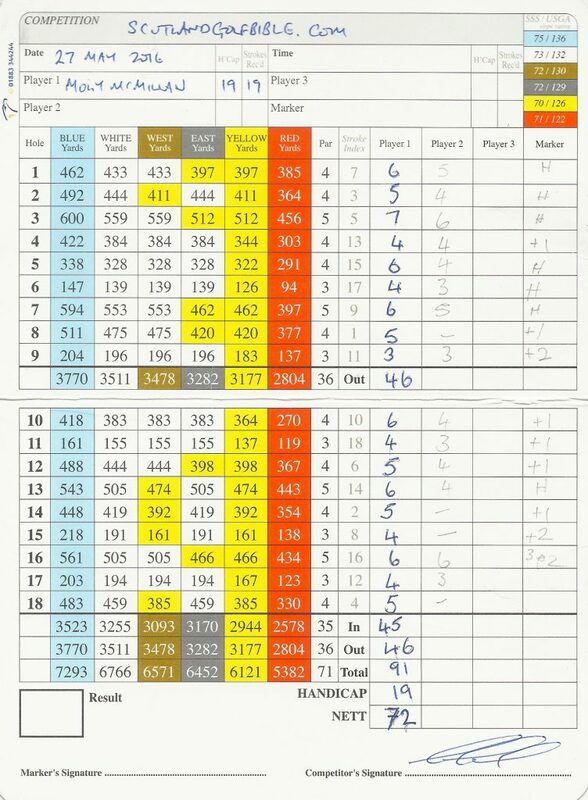 It also has 2 very cleverly mixed white/yellow layouts of around 6500 yards, each recommended for different westerly or easterly winds (see the scorecard below for details). All layouts have a par of 71. The tee view from the stroke index par 4 8th. 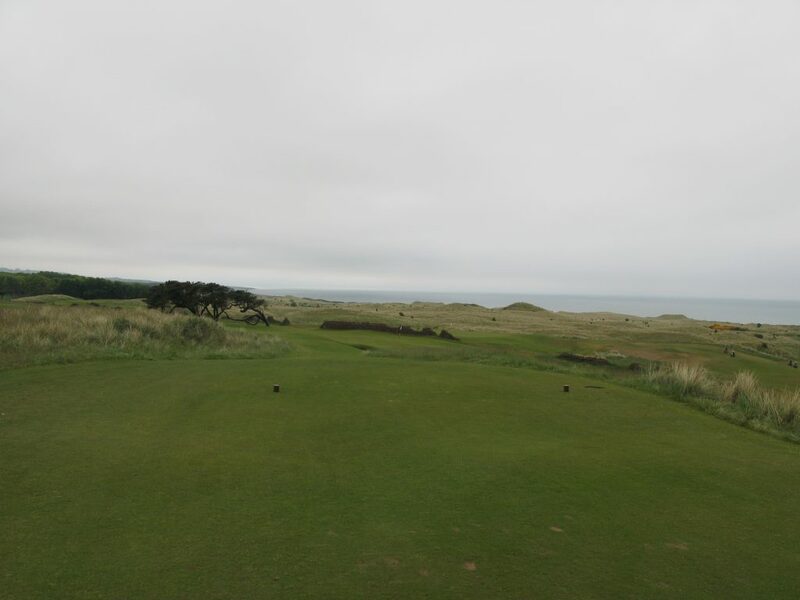 The course was in excellent condition as expected and although spread out over a much greater area than, by comparison, Muirfield, the green to tee walks were still short some almost in the St Andrews way, I suspect by design. The highlight of the course for me was the magnificent greens which had combinations of large and subtle borrows, almost all with very tricky surrounds. Combined with well positioned and deep bunkers, I suspect only the greatest of short game players would win a Scottish Open here. The Renaissance would be a fine competition venue, with many locations for grandstands which would afford viewing of more than one hole. The majestic 10th tee view – I lost a ball into the left cliffs on the one occasion I failed to heed my playing partner’s advice! 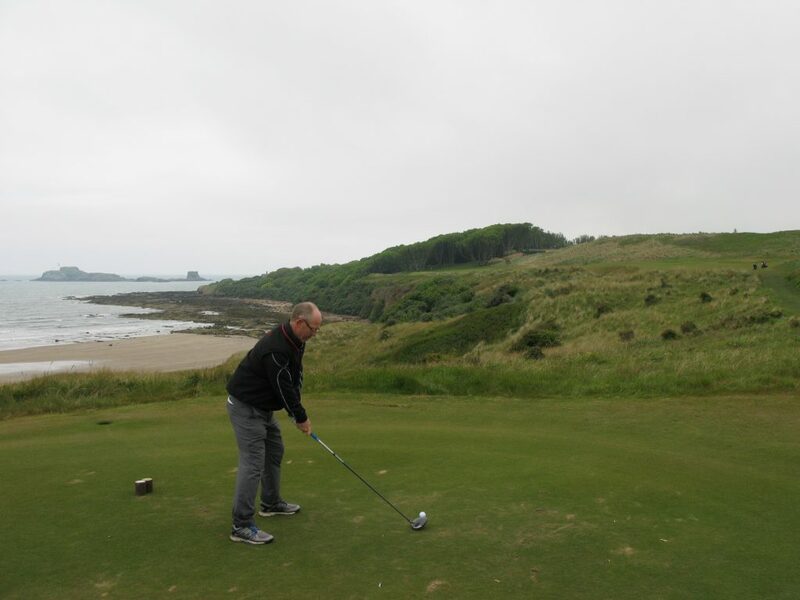 I was hosted by the local professional Ross Dixon, whose wise on-course advice enabled me to play to within one shot of my new lower handicap of 19, which has reduced by 4 shots following a number of lessons by Ross himself, the best measure of golf teaching. The Renaissance layout provides changes of direction on almost every hole, and therefore the difficulty changes likewise. 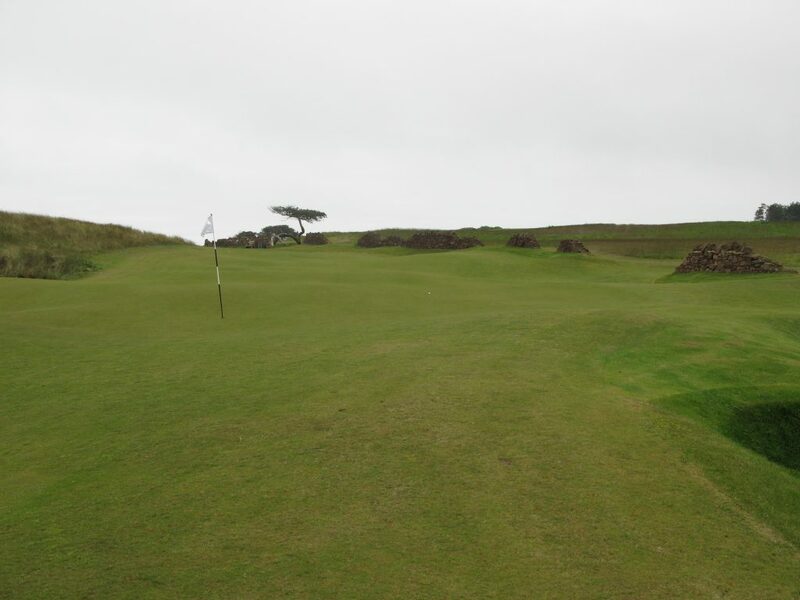 There are many great holes, but the run of 5 holes from the 7th through 11th were for me the architectural and aesthetic highlight; a long par 5 7th, the stroke index 1 8th hole, followed by 2 excellent par 3s (the infinity greened 9th, and the downhill 11th), which sandwich the cliff hugging shortish par 4 10th. All these holes can be viewed using the excellent interactive club website application here. Ross Dixon, after striking another ball far down the middle at the par 4 14th. It was a real privilege to play The Renaissance and I hope that the venue can be used for competitions so that the wider public can see at close hand what a wonderful course it is. Although it was a private club, it was very far from stuffy, in fact I couldn’t help noticing what a wonderfully relaxing and very family oriented atmosphere existed around the club. There is a lot that the older established clubs around Scotland could learn from The Renaissance. 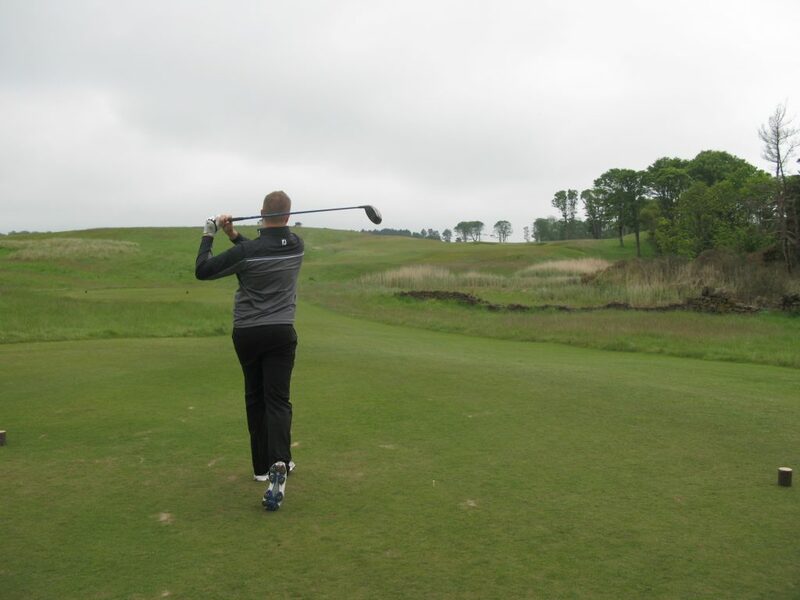 This entry was posted in 18 holes, 5 star, Course Architech, Course Quality, Course Type, Edinburgh & The Lothians, Holes, invitation only, Links, Private, Region, Since 2000, Tom Doak, When Course Established. Bookmark the permalink.